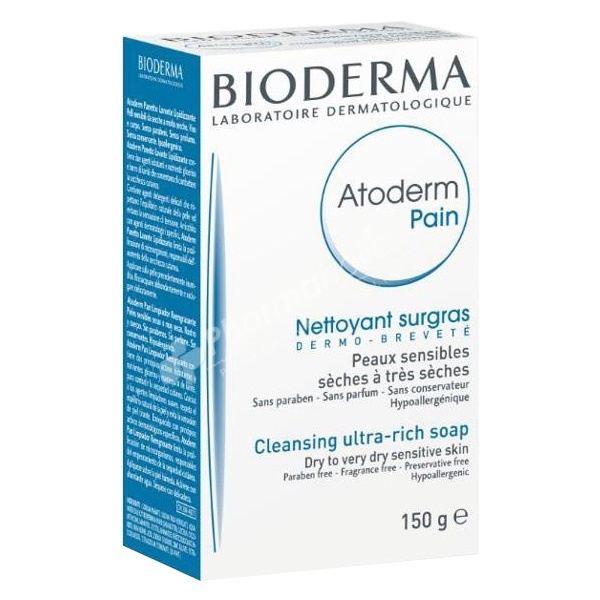 The formula of Bioderma Atoderm Ultra-Rich Soap contains particularly mild, superfatty, soothing and softening cleansing agents. Atoderm Ultra-Rich Soap respects the skin's balance and avoids the epidermis dryness and brittleness. Hygiene of the constitutional dry and reactive skins. Lather into your hands, then apply on wet skin. Rinse thoroughly, dry delicately. Sodium Palmate, Sodium Palm Kernelate, Aqua, Butyrospermum Parkii (Shea Butter), Glycerin, Cyclomethicone, Mannitol, Xylitol, Rhamnose, Fructooligosaccharides, Palm Kernel Acid, Sodium Chloride, Zinc Sulfate, Tetrasodium Edta, Tetrasodium Etidronate.